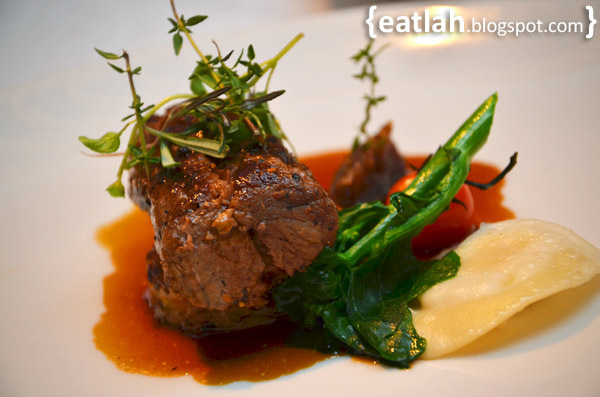 Urban @ Hotel Istana, KL | where and what to eat lah? 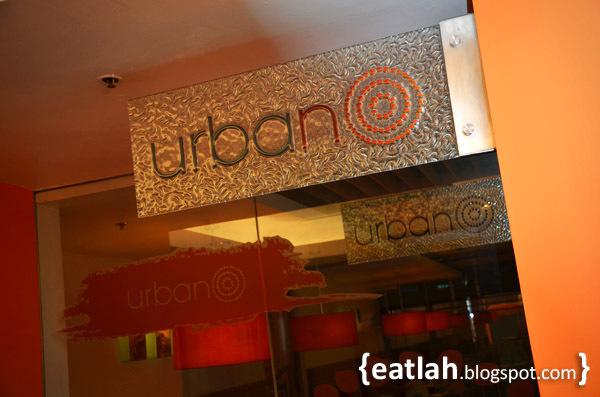 This time, we checked out Urban, an ideal "chill-out" venue where an excellent 3-Course Dinner meal that doesn't burn a hole in the pocket. 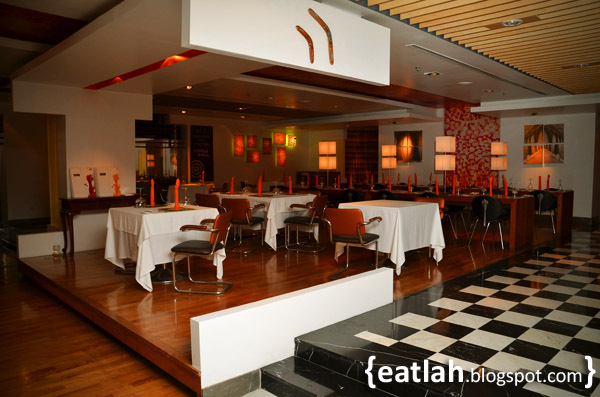 Urban is located at Hotel Istana in the centre of bustling Kuala Lumpur city - it is a contemporary western restaurant with an informal yet relaxing ambience. The Urban décor concept is of fashionably chic design within an ambience of sheer comfort and casual surrounding that displays different seating styles in an open Zen-styled setting. 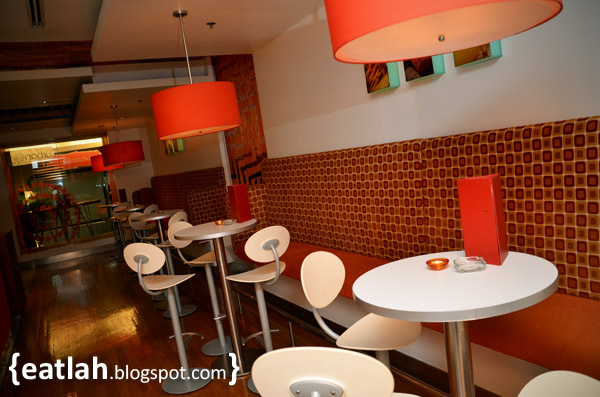 Urban definitely takes the warm and modern orange theme to the max! Urban is ideal for presentations, launches and cosy gatherings with a comfortable capacity of 90 people for social or private get-togethers. 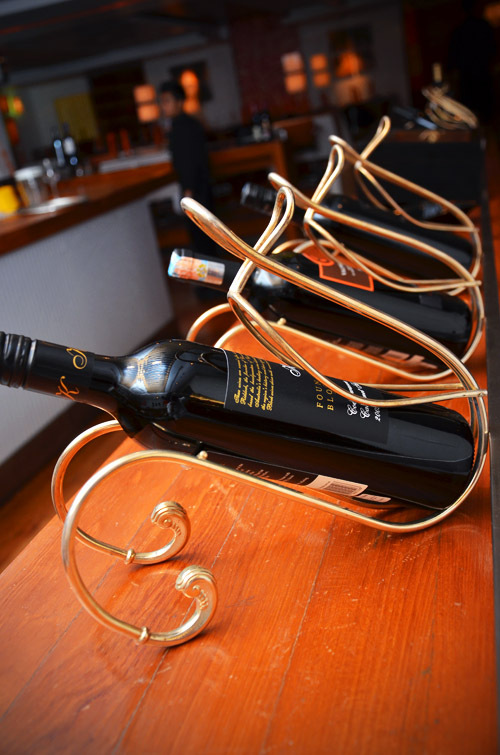 In essence, Urban resembles a culinary theatre, complete with a well-stocked wine-bar featuring over 300 international labels. Urban's signature meal is the Urban Dinner that consists of a 3-Course dinner menu with a choice of appetizers, main courses and desserts for only RM 135 nett. 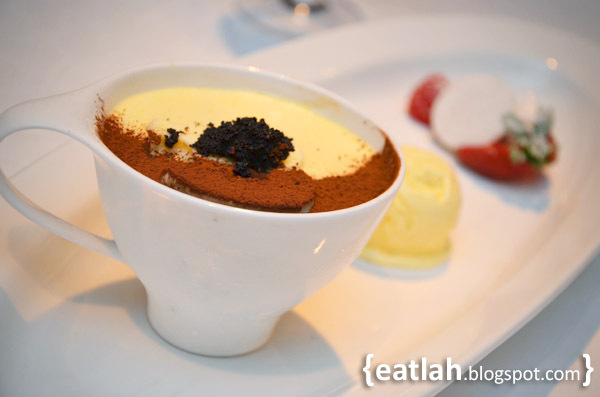 There is also the Gourmet Dinner for RM 175 nett that comes with appetizer, gourmet special and dessert. All inclusive with coffee or tea and special homemade bread. 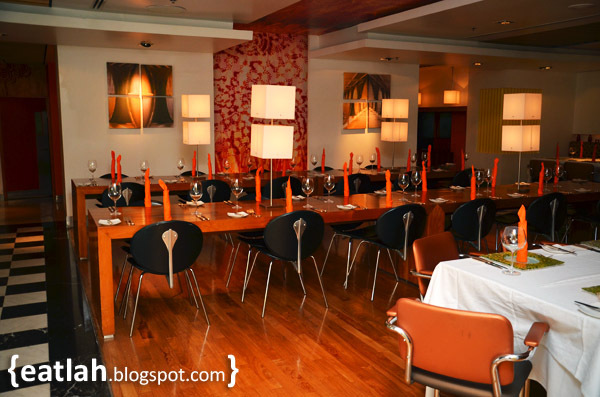 Urban's "Eclectic Fusion" menu defines the art of culinary, creativity and quality - the tantalizing 3-Course Dinner menu selections are the mouth-watering house specialty. Spoiled with a choice of 15 appetizers, before sinking your teeth into the servings of 17 choices of delectable main dishes and follows by 9 sinful indulgence desserts. 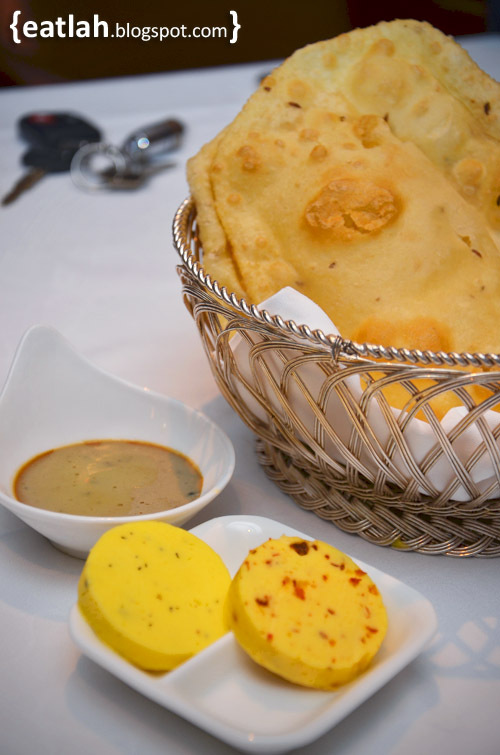 While waiting for dinner to be served, we were treated with Poori Bread with Chicken Pate first. We had poori, an Indian bread, with curry but with chicken pate, it was our first. The poori was nice - freshly fried, light, soft and flaky. The second bread served was Walnut Raisin Bread with Sun-dried Tomatoes Butter and Herb Butter. 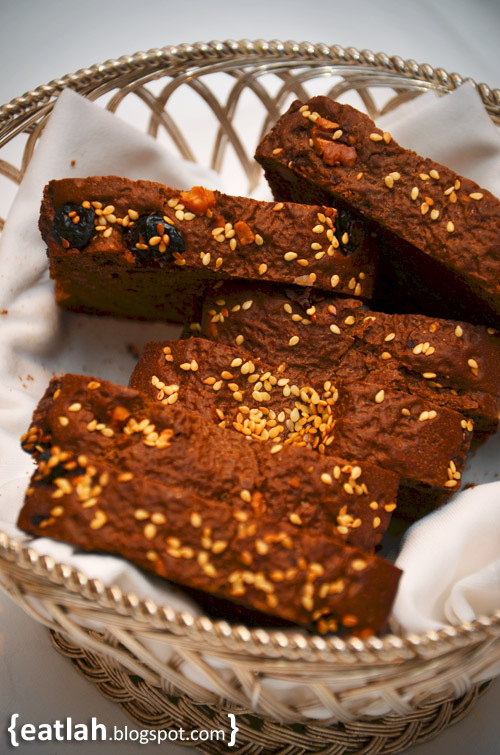 The bread was warm, soft and nutty with a slightly sweet finish. 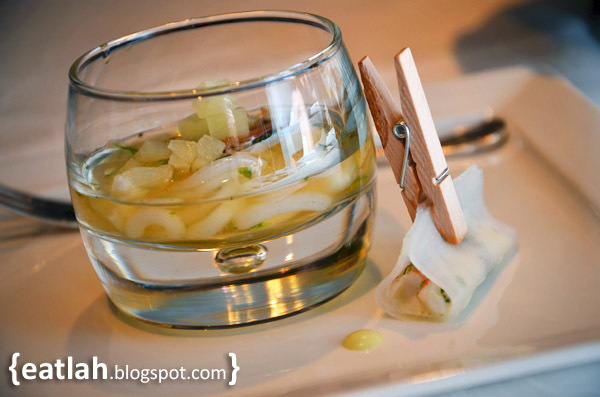 We were given a pre-teaser palate pleaser (amuse-bouche), the Tom Yam Consomme with Laksa Noodles and Daikon Carpaccio. 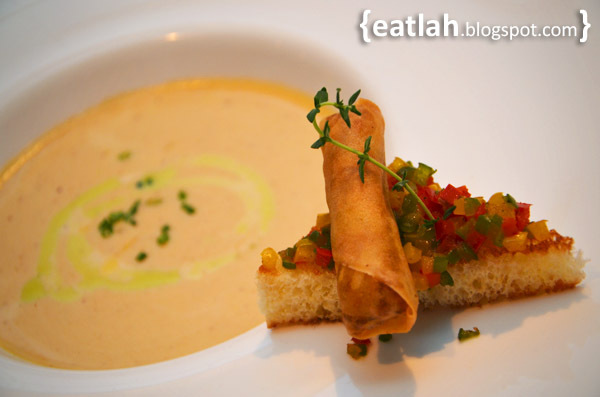 Amuse-bouche, a French term, is different from appetizers as they are not ordered from a menu but are served according to the chef's selection. 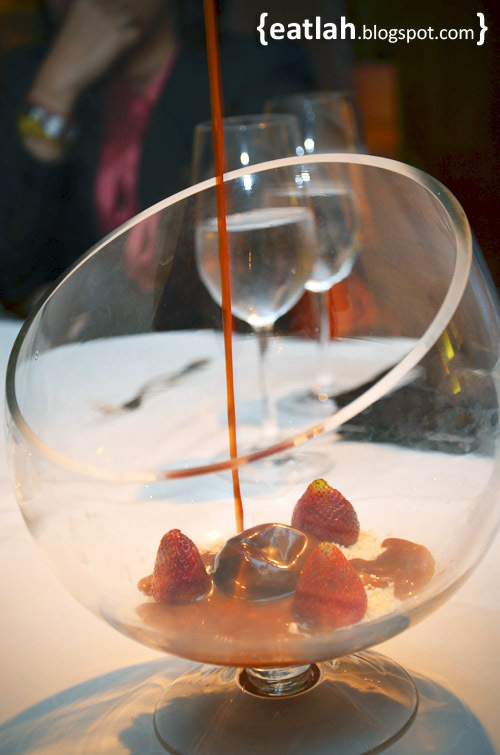 It is meant to prepare the guests for the meal and to offer a glimpse into the chef's approach to cooking. 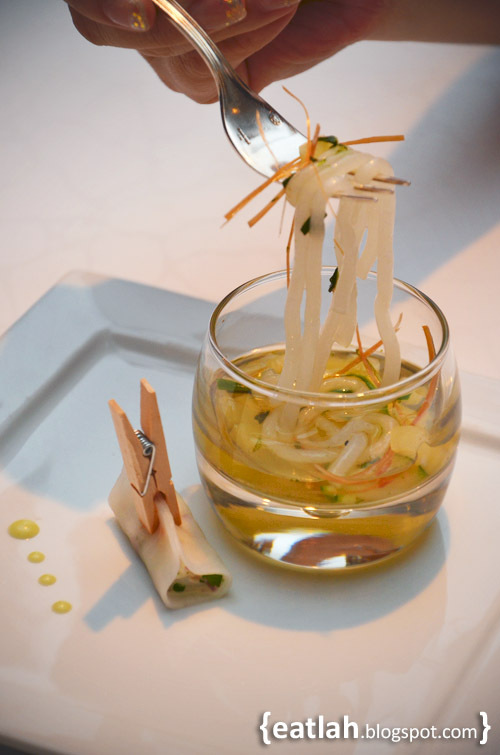 Presented in a mini glass, this clear tomyam consomme was served with silky smooth laksa noodles, pineapple cubes, kaffir lime and ginger torch. 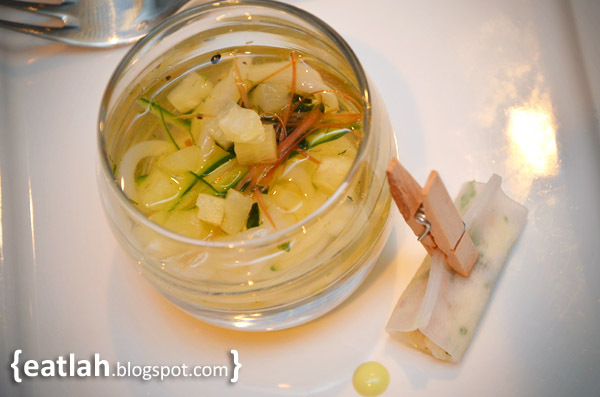 It was our first consomme and it really hit the spot! The consomme was crystal clear yet it was packed with intense tomyam flavor - it requires great skill to achieve a clear consomme soup like this! Daikon Carpaccio, a thinly sliced white radish wrapped with filling of minced prawns, herbs and dressed with droplets of wasabi mayo. Such a beautiful sight. Our appetizers arrived shortly after our taste bud revitalization from the refreshing amuse-bouche. Foie Gras served with Exotic Fruit Chutney, Birgrade Sauce, and Golden Mango Sorbet was unlike any foie gras that we have tasted before. 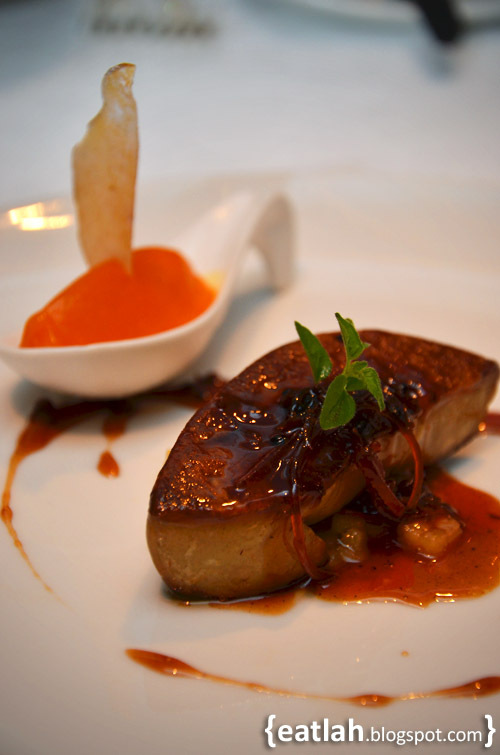 The sweet and sour of the fruit chutney, birgrade sauce and mango sorbet when combined with the rich buttery flavor of foie gras delights the senses in an unimaginable way. 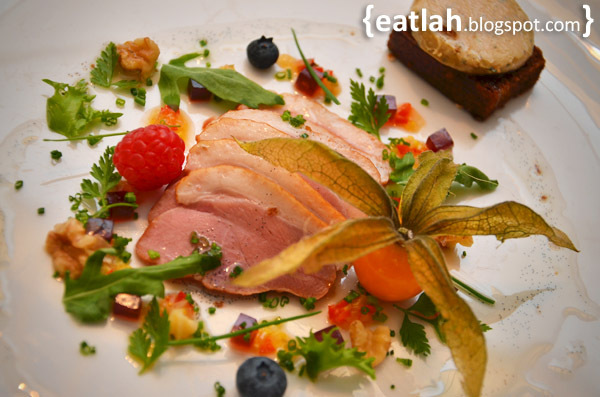 Smoked Duck Breast with Jasmine Tea Fragrance, Cured Foie Gras and Rocket Salad was like a piece of art! The tender slices of duck breast were smoked with jasmine tea, brown sugar, rice and thyme for that smoky aroma. A slab of foie gras was cured using port wine, maldon sea salt, chopped thyme, brandy and served over a spiced bread made from cinnamon powder, 5 spices, garlic and onion powders. Impressive commitment to meticulously prepare this dish! 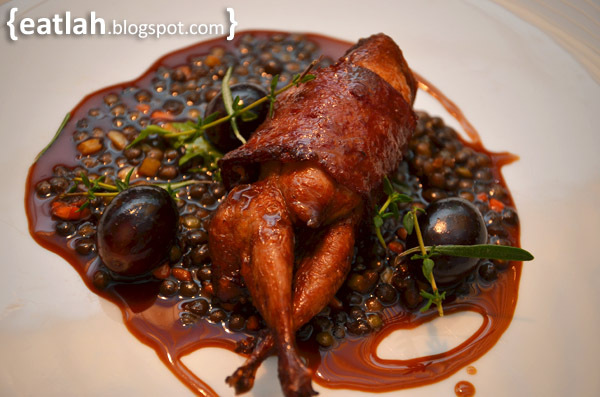 Quail Wrapped with Beef Bacon Strip, Braised Le Puy Lentils, Pètit Salad and Red Grape Jus, partly de-boned quail baked to perfection with slight peppery braised puy lentils from France in a grape sauce made with au jus (it's own juice) and red wine. 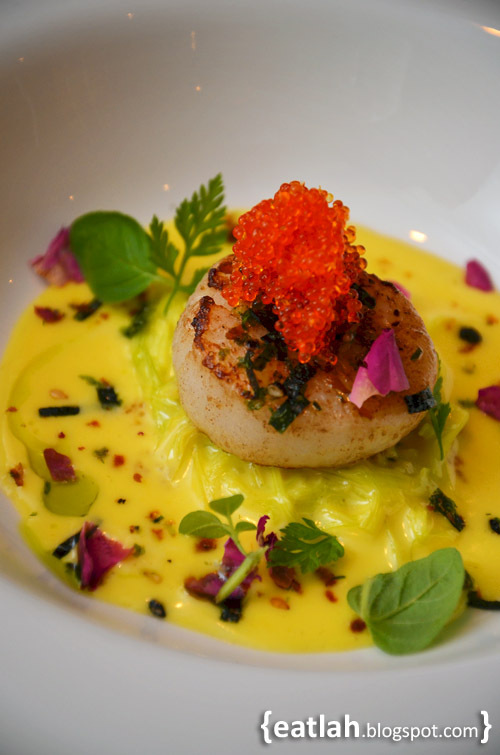 Bay Scallop with Creamy Tagliatelle Leek Fondue and Saffron, fresh pan seared bay scallop swims in a creamy sauce flavored with luxurious Saffron filaments from Spain, tagliatelle-shaped leeks and topped with tobiko eggs. Sake Cured Salmon with Avocado Mash, Crème Fraiche and Tomato Basil Sorbet, fresh Norwegian salmon marinated in a vacuum bag with sake, vanilla bean and olive oil for overnight. 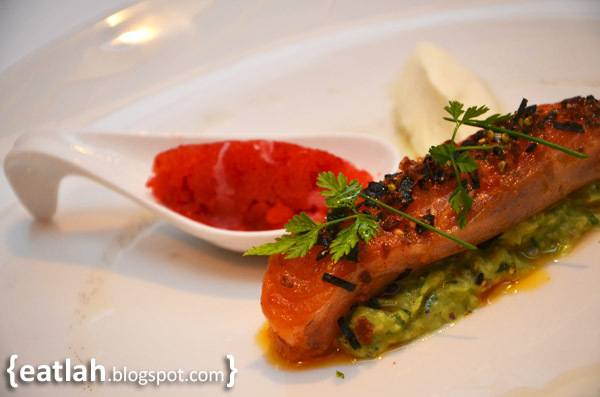 The sake gave a rich flavor that doesn't overwhelm the salmon while the tomato basil sorbet tantalized our palate as a fitting finish to this dish. 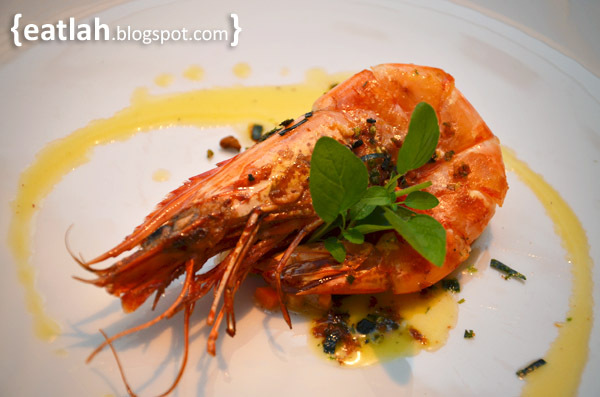 Tiger Prawn served with Root Vegetables, Coriander Dressing and Garden Herbs, pan fried tiger prawn with olive oil, root vegetable, carrot brunoise, white radish, celery, coriander dressing and garnished with seaweed and bonito flakes. Soup of Smoked Garlic, Chicken Roll and Sweet Pepper Stew on Toasted Brioche, sweet pepper stewed with smoked garlic, olive oil, herbs, drizzled with balsamic and accompanied with marinated chicken spring roll over a slice of toasted brioche. As we finished our appetizers, we were served with Calamansi Sorbet Infused with Sour Plum to cleanse our palate. It was a divine jumble of sweetness and citrusy sourness. After the "intermission" sorbet, the main courses arrived shortly. Lamb Loin with Vanilla Date Compote, Cheese Ravioli, Rosti and Fresh Thyme Sauce, the Australian lamb loin was perfectly done with a little lift from the thyme sauce and sweetened date compote. 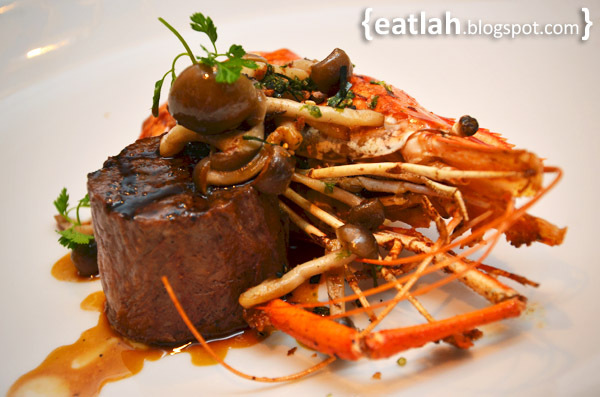 Fillet Mignon paired with Seaweed Butter Blue Leg Prawn and Mushroom Ragout was one of the recommended main course and certainly it didn't disappoint! 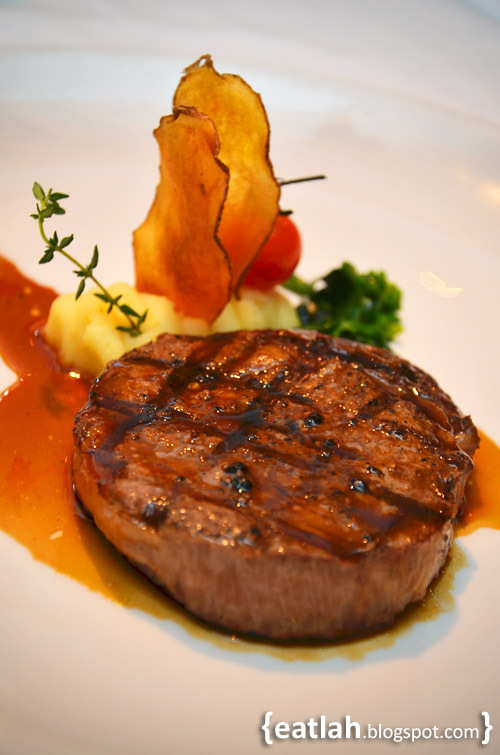 The fillet mignon was juicy and tender - the best of both worlds in one dish. Black Angus Rib Eye with Russet Potato "Millefeuille" and Jus, it was a 120-days grain fed black angus rib eye grilled to medium finish perfection. It was deliciously juicy and tender! We also loved how the chef put in a well-balance marinade for all the meats without overpowering the subtleness of its natural flavors. 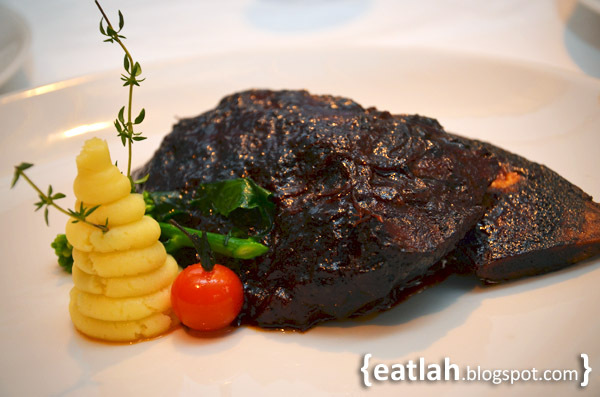 Of the 4 selections under the Gourmet Special, we tried the Grain Fed Short Ribs Fall-Off-The-Bone paired with Tasty Gravy and Creamy Potatoes, it was a huge meaty rib with the exact fall-off-the-bone tender texture as described in the menu! Long and slow cooking made the ribs moist and tender with a crisp crust sweet barbecue sauce. 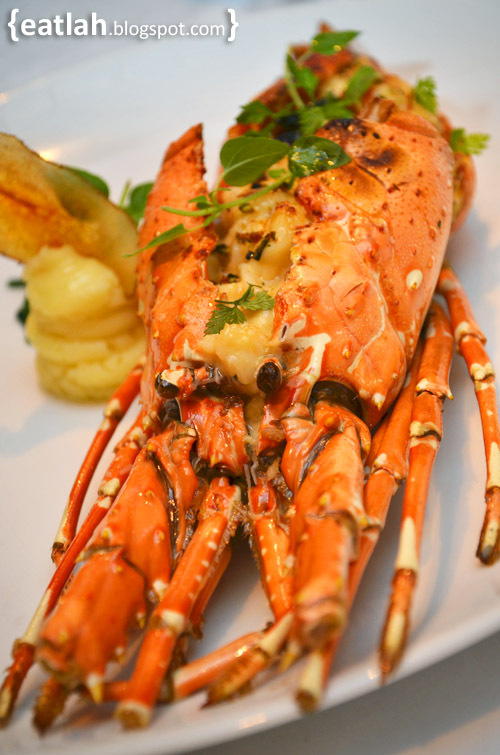 The other gourmet special we tried was the Oven Baked Lobster with Mustard and Brandy with Truffle Mash. The lobster weighed about 700gm, baked with Dijon mustard brandy, cheese, cream and served with mashed potato tinged with the heavenly essence of truffle. More difficult choices to be made for desserts with 9 selections of sinful desserts with each sounding better than the one before. 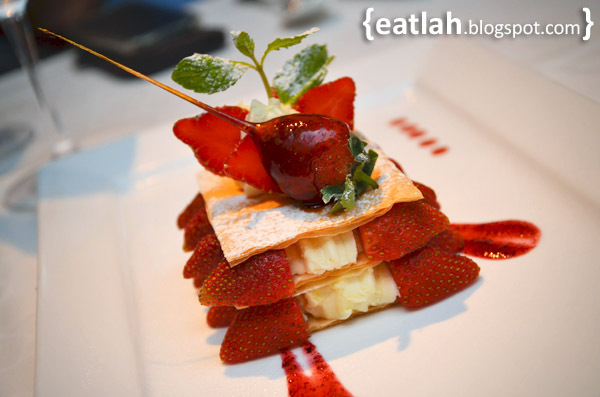 A towering Strawberry Millefeuille with Vanilla Custard and Strawberry Black Pepper Coulis, it looked too pretty to be eaten! 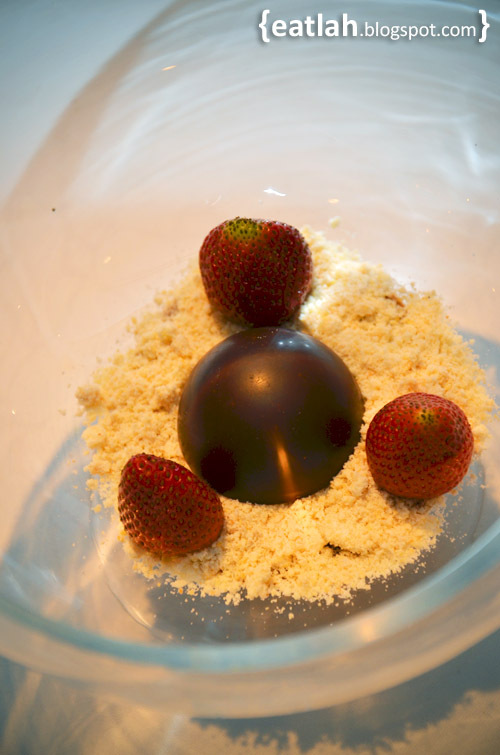 The vanilla custard gave a wonderful sweetness flavor that balanced with the sourness of the fresh strawberry cuts while the thin layers of filo pastry shattered into shards of lightweight buttery in each bite. It was a combination of good texture and uncomplicated flavors. Tiramisu with Pistachio Biscotti and Vanilla Ice Cream, the resulting combination of tiramisu, pistachio biscotti and house-made vanilla ice cream from Madagascar vanilla beans was decently pleasant. 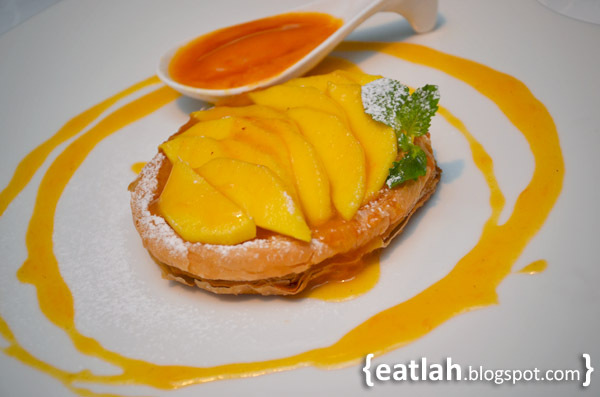 Caramelized Mango with Puff Pastry and Passion Fruit Sorbet, the sweet caramelized mango melted in our mouth which complemented the warm flaky buttery puff pastry. 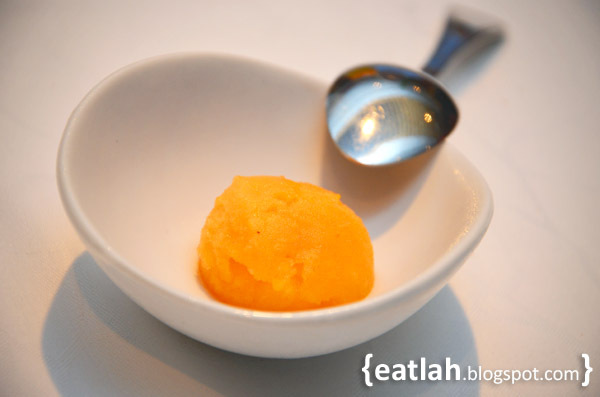 A spoonful of the passion fruit sorbet was a great way to get everyone in the tropical frame of mind. The other dessert that grabbed everyone's attention that night was the Lime Caramel Chocolate, Biscuit Strudel and Strawberry served with Hot Lime Caramel. 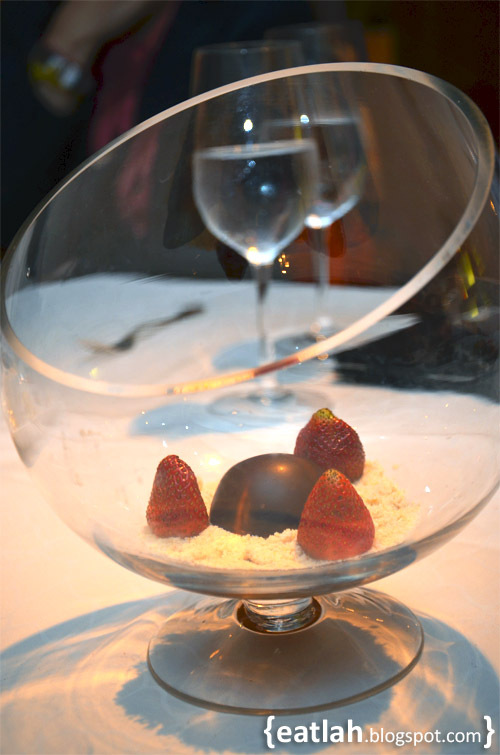 This signature dessert is served in a big stylish glass bowl with a piece of lime chocolate, biscuit crumbs and strawberries. 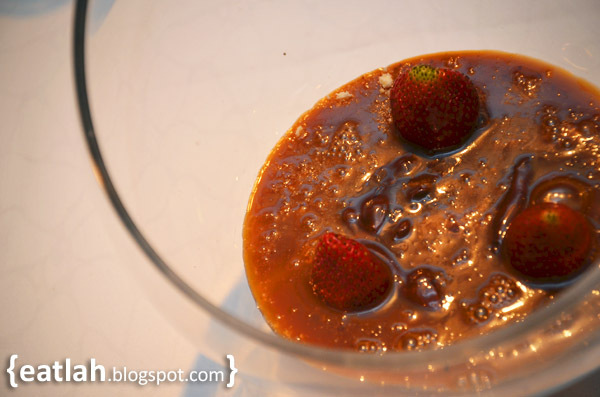 Hot molten lime caramel was poured in and turned it into a swamp of sinful indulgence immediately. 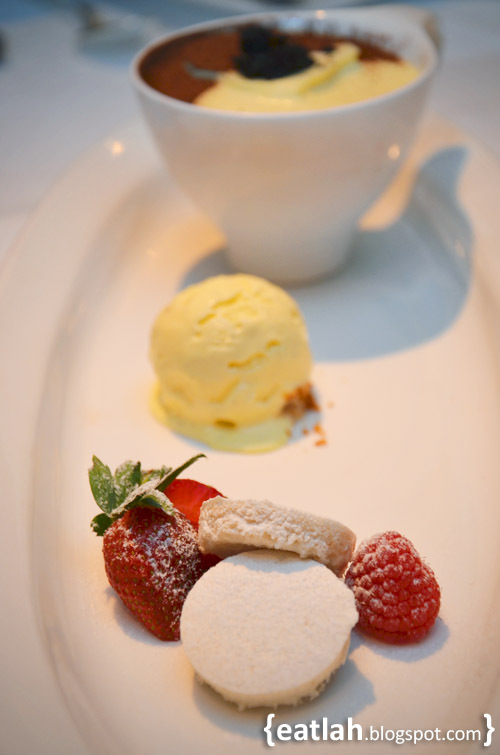 All of us had our share of fun scooping into this bowl of mess like a little child - best eaten while it's hot! 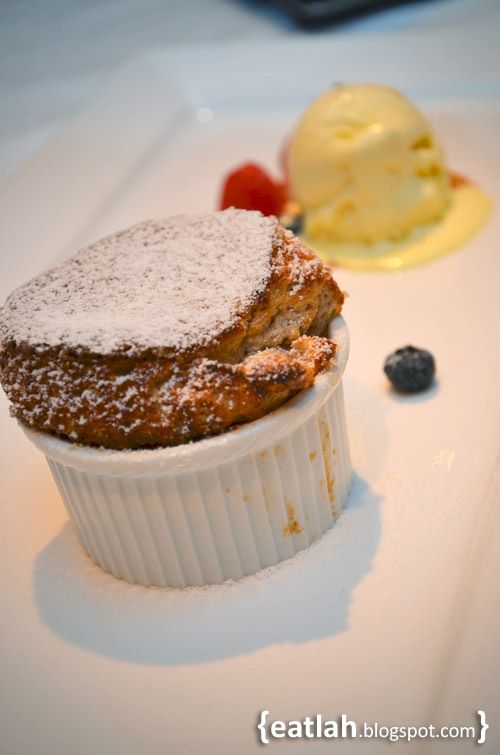 Vanilla Soufflé with Vanilla Ice Cream, this hot souffle was fluffy, light, crispy on top, slightly moist in the center and served with a vanilla ice cream. It was simply wonderful! 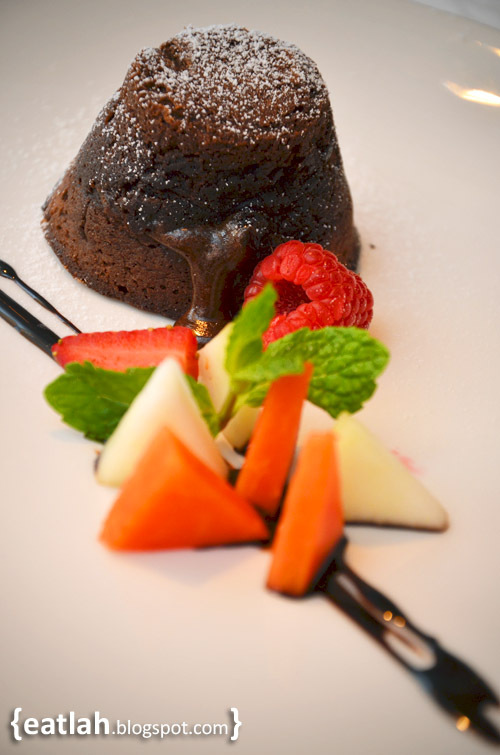 Chocolate Lava Gateaux served with Chocolate Ice Cream, the sight of the rich lava chocolate oozing out of the gateaux and a taste of the cold chocolate sorbet sent us shivers of excitement. 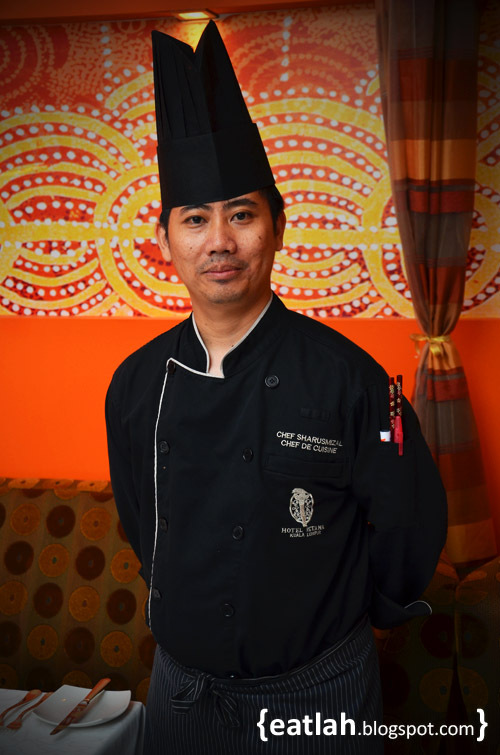 Chef Sharusmizal, the man behind the range of culinary delights at Urban who enjoys to flirt with complementing flavors while staying true to original taste. Most of the dishes we had were outstanding in terms of quality and also in portion. Stripping them apart, the appetizers are RM 45 nett per dish, the mains are RM85 nett per dish and the desserts are RM35 nett per dish. However, as a 3-Course Dinner you get an unbelievable RM135 nett per person, or RM 175 nett per person for the 3-Course Gourmet Special. All topped off with coffee or tea and special homemade bread. 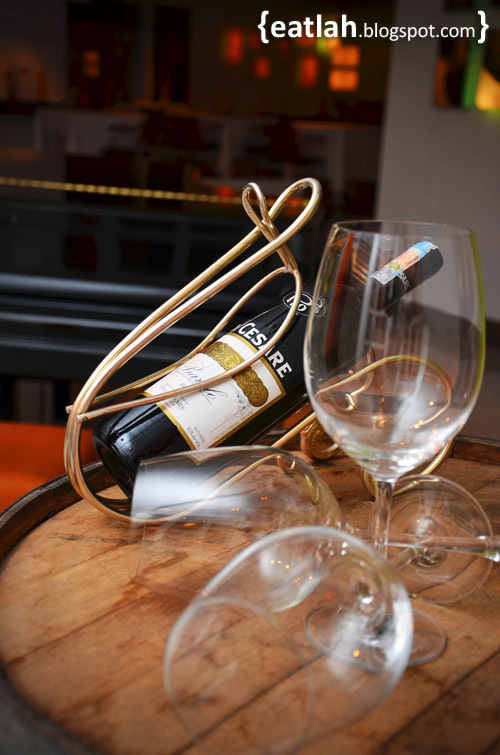 Business Hours: Opens Mon - Fri from 12m - 2.30pm for carvery lunch and 6.30pm - 10pm for dinner. Saturdays open for dinner only. Closed on Sundays and Public Holidays. to a skin tag o'er a foresightful period of clip mightiness rid of or bring down the Appearance of the skin tag.